Thanks to everyone who voted! We are pleased to announce that the winner for Spotlight 150 is the Justice for Abdirahman Coalition! Stay tuned – we’ll be bringing Spotlight 150 to a region near you! We’d like to spotlight more community groups right across Canada! Take a look at the incredible list of nominees one more time! Bridges of Mercy raised approximately $275,000 to sponsor Syrian refugees. To date, they have brought three families (15 individuals) to Canada and partnered with both an interfaith and an individual group to sponsor 2 more families. BOM also has more sponsorships underway. The team actively helps other Syrian families in the GTA. They have partnered with organizations and individuals to achieve their objectives. Bridges of Mercy hopes to use their platform to help the needy in the local community. The idea started in Fall of 2015 with a few clinics in Ottawa signing up. Within 6 months, there were approximately 90 dental clinics across Canada who signed up to provide free emergency dental services to refugees. CW works with Institutions across Canada to raise funds for orphans and needy children. CW makes Canada stronger by bringing together youth, encouraging them to set aside their differences and unite to help orphans and children in need. Over the past 9 years, Expressions of Muslim Women (EMW) has nurtured, supported and provided a forum for exhibiting the creativity of Muslim women in the National Capital region of Ottawa. EMW has produced an annual event that entailed the exhibition of visual art by Muslim women and a stage production for Muslim women performers to share their personal expressions through drama, poetry, spoken word, music, comedy and storytelling. EMW annual events have enabled the sharing of local talent with sold-out crowds from across faith and cultural backgrounds, giving local Muslim women a place to share and grow in their respective talents. This past year, EMW was able to get official support from Ottawa2017, the JUNO Host Committee and the Ottawa Music Industry Coalition to produce their latest music only show which was recognized by many media organizations such as the CBC, the Ottawa Citizen and CKCU-FM. Justice for Abdirahman is an Ottawa based group supported by local and national advocacy groups. The objective of the coalition’s campaign is to obtain greater transparency, challenge racial inequity, and bring positive change in order to secure justice for the late Abdirahman Abdi and his family. Since the inception of the Coalition after Mr. Abdi’s death in July, we have been very active in the city of Ottawa. The Coalition and its members have spoken and participated at various community advocacy events and functions addressing racism, policing and mental health awareness. MAC Kitchener-Waterloo Provides thousands of meals to the Waterloo Food Bank. This year alone they provided close to 96,000 meals. They are involved in the annual multiple sclerosis (MS) walk. Sponsors the clean up of Old Oak Park. MuslimFest launched in 2004, after 18 months of deliberation and planning by a group of professionals, activists and visionaries that felt the need for a safe space for the Muslim community, particularly the youth, to celebrate and share their identity on a positive platform. Displaying art and culture was chosen as the medium because of its ability to be a commonality between different cultural/ethnic communities while being universal at the same time, allowing for a space that can facilitate dialogue and build bridges between Canadian Muslims and their neighbours. In a post 9/11 world, when the media was flooded with violent images of Muslims and Islamophobic narratives and rhetoric were widespread, MuslimFest became an opportunity for the creative Muslim community to communicate their thoughts and beliefs in a way to challenge those narratives. MuslimFest tackled the stigma that arts carried within the Muslim community by celebrating and promoting artists – the same artists that were representing and sharing the stories of these cultural communities. 14 years later, MuslimFest is attended by 30,000+ attendees, has engaged hundreds of artists in visual, performance, theatre and other forms of art, and has given rise to a platform that is very diverse and representative of many communities that now populate Southern Ontario today. It is an award-winning organization recognized and supported by all three levels of government as well as many community groups and businesses. The Muslim Medical Association of Canada is a platform for Canadian Muslim Physicians to contribute to the betterment of their communities, society, and humanity. It was formed in 2007 and currently has over 700 members. Over the years MMAC has helped with incoming medical trainees, networking, and setting a positive example of the contributions Muslims can make in Canada. ​MMAC aims to provide unique professional, educational and social services not only to its constituents, but also to the general public as a whole, ultimately contributing to building a healthy and just society on a regional, national and international level. MMAC held its first Annual Islamic Bioethics Conference, in April 2017, which addressed Muslim patients and health provider’s needs. The goal of the conference was to provide healthcare providers with a review of common bioethical issues from an Islamic perspective that may impact their Muslim patients’ health care decisions. In 2016 the Canadian Muslim Mental Health Conference was organised by the MMAC University of Toronto Student Chapter in collaboration with the Department Of Psychiatry. Other services include: application and interview guides, mock interviews, mentorship, advocacy, community presentations, and social events. Established in 2009, Project Ramadan fund raises, assembles and distributes baskets containing staple food items that help recipients – regardless of race, nationality or ethnicity – create healthy, balanced meals during the holy month of Ramadan. Hundreds of generous and enthusiastic volunteers from across the city band together to make this initiative possible. 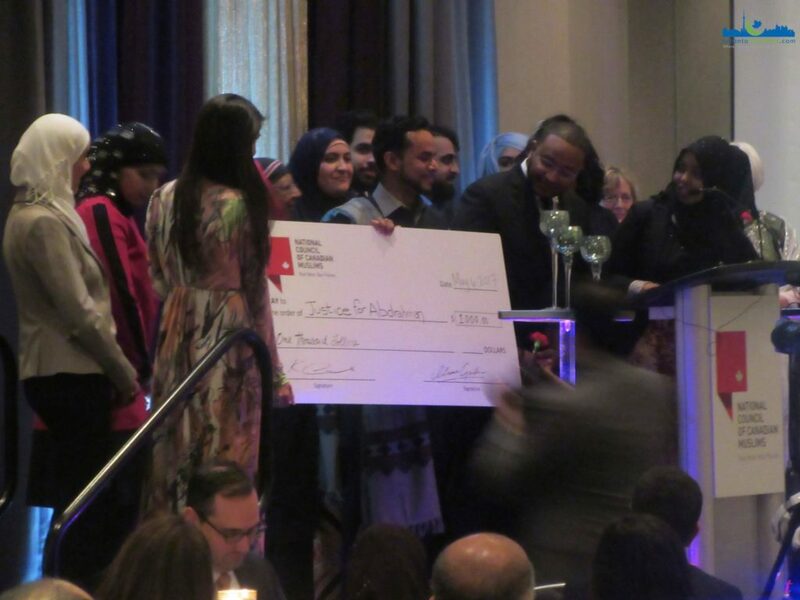 As a program of the Muslim Welfare Centre of Toronto (MWC), Project Ramadan has proudly raised more than $374,000 and successfully dispensed more than 7,400 baskets through the MWC’s food bank network of more than 11,000 community members. Since day one, every basket built has been distributed through the MWC’s Halal Food and Essential Items Bank, with a network of more than 11,000 registered users. Racialized Young Professionals Network (RYPn) was started in 2015 and is committed to anti-racism work locally and across the province. They have held four networking dinners which aim to break down racial barriers by inviting various guest speakers to share their stories and build a sense of community. RYPn has co-facilitated workshops for refugee youth, anti-oppression training and just this past month, for the Mental Health Awareness Youth Conference in Muskrat Dam. RYPn has spearheaded Muslim Women’s Roundtables to elevate Muslim women’s voices. RYPn has also created a podcast titled ‘Racialized the Podcast’ with four episodes thus far featuring conversations across the racial divide. In the summer of 2015, a group of Rohingya refugee youth (ages 8-22) from Kitchener, Ontario decided enough was enough. No longer would the plight of their people be ignored by the media and the international community. Together, they opted to share the stories of their families’ harrowing escape from Burma, chronicling what life is like living in a refugee camp and portraying the struggles of resettling in a new country. At that moment, “I Am Rohingya” was born. Since the summer 0f 2015, these youth have been working extremely hard to make their stories heard. Opening night was April 2016 to a sold-out audience in Waterloo. Getting attention from CBC, Rohingya Vision TV, and even getting the chance to meet Prime Minister Justin Trudeau, these youth have surpassed expectations and made a name for their people. With no prior acting experience, the decision to re-enact the stories of their people was a courageous act of resistance, demonstrating to the world that they will not be erased, and they will not be forgotten. With so many refugees coming to Canada and fleeing horror, it is important that we as Canadians remember that they have a story to tell, a voice and a unique way of expressing it. “I Am Rohingya” is an example what can happen when refugees take control of the narrative for themselves and redefine what it means to be a “refugee”. Through this project, the Rohingya youth community have a felt a sense of agency in creating social change and awareness for the plight of their people. Sanad’s director, Shaykh Hamdi Ben Aissa, teaches and leads programming in various cities across Canada. In addition to spiritual learning, counselling and chaplaincy services, Sanad is involved in interfaith and cultural events, and neighbourhood social initiatives such as the Jasmine Coalition in Ottawa. Sanad Collective recently inaugurated an educational institute and mosque, the Rhoda Institute. Activities include weekly potlucks and holiday celebrations for people of all backgrounds. Sanad’s message is that it is possible and necessary to achieve peace on a grand scale by first cultivating peace within oneself, with one’s Creator, and with others. Sanad Collective continues to combat extremism by offering safe teachings that have an actual source in traditional Islam and to offer peaceful solutions to the frustrations and concerns of modern Muslims. Important position papers on extremism, social justice and the connection between Muslims and Christians have been produced. Some notable past activities include: the first French-language Islamic annual spiritual retreat in North America; a mentorship camp for young men; Zidni Ilma School, a weekend day program for young boys and girls to learn about spirituality; a Christmas dinner for neighbours of the Rhoda. This is a group of Muslim moms who started out sponsoring a single Syrian family but in two years time, had sponsored five families by raising more than $80,000. They started a 90 Days program in which this group supported other newcomers Syrian refugees by providing them monthly groceries , laptops and other house hold items during their first 90 days in Canada. They ran a Bag of Generosity and Love Program on Family day 2016 and 2017 in which they provided 100 bags of groceries to 100 families in GTA and provided 100 bags containing health and sanitary items to homeless persons registered with the Red Cross Scarborough center. Last Ramadan they ran a food Drive to help ICNA and Eden Food bank and was a major participant in the food drive organized by UICM group and which was recognized by Mississauga Mayor Bonnie Crombie. They also ran a toy drive for EID. In Christmas 2016 they ran a program called “We Muslims do Care” and provided gift bags to 100 homeless and under privileged Canadians registered with Red Cross Scarborough center. The Abraham Festival of Peterborough, now in its 14th year, had its roots in the desire of three women – a Muslim, a Jew and a Catholic – to celebrate our roots in our common ancestor Abraham, peace be upon him. The festival has brought together people of these three faiths (and others) to promote understanding and acceptance of ‘the other’. When the mosque in Peterborough was fire-bombed in 2015, community support for local Muslims was outstanding – five different churches and the synagogue offered space for Friday prayers; this outpouring of support was in large part due to the work of the Abraham Festival in building bridges, building friendships, and dispelling stereotypes. In the fall and winter, the AF sponsors a movie night, showing films with a spiritual or religious theme. The AF also sponsored a Syrian refugee family last year. Concerned about the potential negative impact of the proposed Bill 94 in Quebec, over 50 Muslim women from KW came together to organize a community forum titled “Let Us Talk” at Kitchener City Hall on April 26, 2010. Attended by over 150 community members and the local media, the forum was a proactive opportunity for Muslim women to add their voices to the public discourse about them, while diminishing many misconceptions. Following the success of this event, the group decided to continue their association and form an organization, “The Coalition of Muslim Women of KW” with the aim to build bridges of understanding with the larger community and to strengthen the voices of Muslim women in this area. Now, CMW is a federally incorporated not-for-profit organization with 42 members and over 100 volunteers, offering high quality events and programs working in partnership with numerous not for profit organizations in KW. With a large body of diverse and dedicated members and volunteers, CMW is the only organization managed solely by Muslim women in Kitchener-Waterloo. CMW’s membership and volunteer opportunities are open to all women who are in agreement with organization’s vision, mission, values and code of conduct regardless of their religious or non-religious affiliation. CMW’s existence and outreach is our response to the negative stereotypes and the hurt that they have caused most if not all of us. This very small initiative has grown into a movement that has mobilized the community of Muslim women. The Serenity Islamic Mental Health Awareness Initiative has been working diligently the last two years to bring mental health awareness to the Muslim community with psycho educational workshops and presentations that led up to Canada’s first Muslim mental health Conference. These successful events were met with positive reviews from both Muslim and other faith communities in helping break the stigma surrounding mental health and to reaching out to those who are suffering in silence. This organization has being working within the community for the last 15 years and was established in November 2011 as Canadian non-profit organization. Raises and discusses emerging issues and topics that are of concern to women, allowing for the potential development of new interventions. SWCN is very proud of their great working partnership with men in general and Somali men in specific. SWCN have being very successful creating a dialogue that allows men to be part of the solution to empower women, men, boys and girls. The Truth & Dare Project provides series of free photography-based mixed-media workshops for young Muslim women in the GTA. We aim to create a safe space for young Muslim women to collaborate with others who have faced similar adversities; learn individually and collectively; and explore art as a creative outlet to share their stories, their struggles, and their triumphs. Participants will find mentorship in youth leaders and artists, build community with those who share relatable experiences, and most importantly, leave with the feeling that they have a safe support system in place. The Truth & Dare Project was founded in 2011 by Zahra Agjee, a photo based artist and youth arts educator. Her aim was to create a space for young Muslim women, who have faced multiple marginalizations and barriers, to build community and use the visual arts as emotional expression and an outlet. This project has run multiple workshops series and one-off workshops, implemented a Youth Leadership Program to employ and mentor past project participants, and showcased participant and community artwork in multiple exhibits. To date, the project has held a pop-up exhibit at the AGO, 3 successful visual arts exhibits at the Daniels Spectrum and Artscape Youngplace and was a part of the Scotiabank CONTACT Photography Festival in 2015. The Truth & Dare Projects yearly exhibit is a space that is like no other as it showcases a diverse group of Muslim women whose work aids in the facilitation of cross-cultural conversations.